Sensitive skin. Gentle and protecting. Calms delicate skin. Fragrance-free. Sensitive dry skin. Certified natural facial care. Free of synthetic preservatives, fragrances, colourants. Free from mineral oil derivatives. 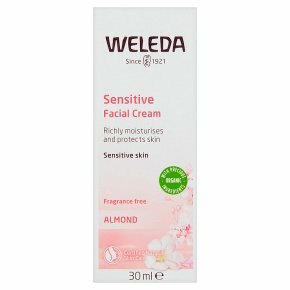 Almond Facial Care The products in this unperfumed range are specifically developed for sensitive skin with organic almond oil to restore the skin's balance and enhance it's protective layer. Carefully selected natural ingredients soothe the skin and alleviate irritation and reddening. Almond Facial Care protects sensitive skin just as the organic almond has a shell to protect it's kernel. Soothing Facial Cream The fragrance-free Soothing Facial Cream supports the protective functions of sensitive skin. Stabilises the natural lipid mantle Calms the skin Intensive moisturising action Can be used for both day and night care.